March is DVT Awareness Month. We have discussed DVT (Deep Vein Thrombosis) many times and it is such an important topic, it is time to review again. Your veins are thin-walled blood vessels that carry oxygen-depleted blood from the tissues back to the heart and lungs to be re-oxygenated. In order to move the blood back up against gravity, the calf muscles in the leg squeeze the deep veins to move the blood back to the lungs and heart. The human body has three types of veins; Superficial Veins which are the veins that are close to the skin (the ones that you can see), Deep Veins which lie within the muscle structure within the body and Perforating Veins which connect the deep veins to the superficial veins. The veins contain one-way valves for the return of the blood back to the heart and lungs. When these valves do not close properly, stagnation of the blood can occur and a deep vein thrombosis (DVT) can form, most often near a venous valve. The DVT can permanently damage the vein wall and valves with scarring or fibrosis, which can cause them to become incompetent, or non-working, resulting in reflux (backward) flow of blood and venous congestion. The DVT can break loose and become a life-threatening Pulmonary Embolism (PE). Compression socks and stockings work as a secondary pump and along with the calf muscles to close the venous valves, assisting to move the blood back to the heart and lungs. There are many ways to develop a DVT, but we can take many steps in helping prevent DVTs, especially when we travel, whether by airplane or by a long car or truck ride. It seems natural for the average airline passenger has greater concern about the airline crashing than about developing a life threatening DVT, that is likely due to knowledge of DVTs, or more specifically, our lack of it. While the chances of developing either of these conditions is very small, some people when they fly or take long car or truck trips, may be more prone to developing a DVT than others. The picture to the right represents one of our many clients. He is in his mid 60’s and is preparing to go on an airplane trip which is not a long haul…his trip may only last 3 hours, but what he is doing may save his own life. A study by Aviation Health Institute has shown that 17% of DVTs occurred in association with short flights. A British newspaper published findings that the occurrence of DVT in short-haul flights was more prevalent than expected…4.3% of 568 passengers developed clots which were detected by ultrasound. Two of the passengers actually developed a pulmonary embolism. This has led the researchers to hypothesize that blood clots develop in the first 2 to 3 hours of flight and become larger and more dangerous with longer flights. Not all blood clots are symptomatic and some small ones do resolve on their own. The picture to the left represents a group of individuals who you would not normally associate with developing a DVT; the young, fit and healthy. Again, these individuals may actually be helping to saving their own lives by wearing support socks during outdoor activities and during air travel. Athletes and especially endurance athletes show a high incidence of developing a DVT. This may be due to their efficient cardio system pumping blood more slowly. It has been claimed that up to 85% of flight DVT victims fall into the athletic category. 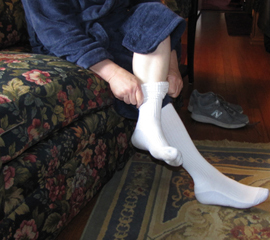 One study has shown the near elimination of DVTs in the young, fit and healthy category when they wear compression hose or support socks. Many athletic teams require their members to wear compression socks when they fly. Keep hydrated with electrolyte-balanced solutions and or water. All these can be discussed with your physician; wearing properly fitting support hose or support socks may be a very effective preventive measure. Know the Symptoms of DVT and if these develop seek medical attention immediately. Call one of SupportHoseStore.com’s Certified Fitters for assistance with selection and sizing of support hose or support socks for assisting you in the prevention of DVT, especially during travel.